The Miramichi Salmon Conservation Centre (MSCC) is the oldest operating Atlantic salmon hatchery in Canada. Located in South Esk, New Brunswick, the facility is only 5km west of the City of Miramichi. The first buildings and ponds were constructed in 1873 and Atlantic salmon eggs were collected for incubation that year. The MSCC has operated continuously since that time growing both speckled trout and Atlantic salmon. In 1997, the Department of Fisheries and Oceans transferred the hatchery and the responsibility for stocking salmon in the Miramichi River to the local community through the Miramichi Watershed Management Committee. This umbrella organization is made up of several conservation groups, First Nations, corporations, outfitters and guiding associations from the region. The Miramichi Salmon Association, a non-profit conservation organization established in 1953 to lobby for the conservation of the Atlantic salmon for future generations, operates the MSCC on behalf of the Committee. 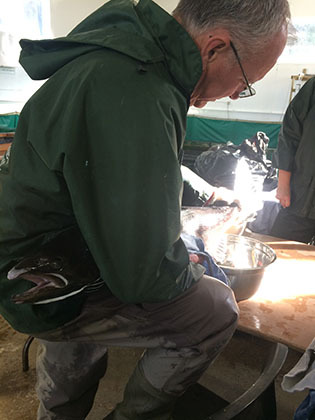 The priority of the Miramichi Salmon Conservation Centre continues to be enhancement efforts to sustain optimum populations of juvenile salmon stocks in the Miramichi watershed. Beyond that, the MSCC raises indigenous brook trout enhancement stocks, has become the focal point for salmon research studies for the Miramichi, and plays a role in educating the public on Atlantic salmon conservation.